The What: QSC has launched the Q-SYS Core 510i Integrated Core processor. An evolution of the Q-SYS Platform, the Core 510i processor leverages the latest Intel platform using a QSC-developed Linux realtime operating system (RTOS) for a powerful audio, video, and control (AVC) solution. The What Else: Unlike other Q-SYS processors, the Core 510i can be deployed in two different software configurable modes: Q-SYS Core mode, which handles all AVC processing including extensive resources for built-in acoustic echo cancellation (AEC) that can be deployed with the new Q-SYS AV-to-USB Bridging solution for soft codec conferencing applications; and I/O Frame mode, for support of up to 128x128 audio channels as an I/O peripheral into the Q-SYS system for processing on a separate Q-SYS Core processor. It can accommodate any combination of Q-SYS Type-II I/O cards including Dante, CobraNet, AVB, or Q-SYS analog and AES/EBU cards. The Bottom Line: The Core 510i processor offers the most flexible audio I/O configuration options of any processor in the Q-SYS catalog, with card-based I/O as well as native Q-LAN network channel and AES67 capabilities. 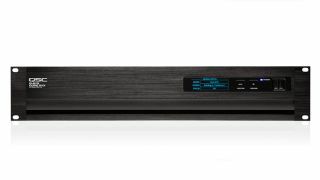 It is well suited for applications that require a diverse mixture of analog, digital, and networked audio connectivity, including mid- to large-sized meeting spaces and hospitality applications.